Ashley and Tyson Gardner wanted a baby. They tried the natural approach for eight years with no luck so they turned to in vitro fertilization (IVF), which was an astounding success. They became parents on Sunday, December 28, when Indie, Esme, Scarlett, and Evangeline were born and quickly became the darlings of the internet. The four girls — affectionately known as the Quad Squad — are two sets of identical twins, an occurrence so rare that a Harvard professor has estimated it to happen only once in 70 million births. An added element to the miraculous nature of the Gardner girls is their conception during the first try with IVF. A 2013 study involving analysis of more than 14,000 IVF cycles revealed the success rate of the first two IVF cycles is only about 40%. It’s not until the sixth cycle that the success rate of IVF reaches 51% to 71%, the same rate of live births experienced by women with no infertility issues. Dr. Alan Penzias, an associate professor of obstetrics, gynecology, and reproductive biology at Harvard Medical School and co-author of the 2013 study, describes the Gardner quads’ birth as one in 70 million. The Gardners, of Pleasant Grove, Utah, knew friends and family members were praying for their IVF success but a baby announcement featuring the stunned but ecstatic couple holding four sonogram photos came with the caption “some of you may have prayed too hard.” All prayers were answered this week when the four girls were born at the Utah Valley Regional Medical Center. In October, it was discovered that one set of twins had twin-to-twin transfusion syndrome, a condition of the placenta that causes one baby to get too much blood while drawing it away from the other. 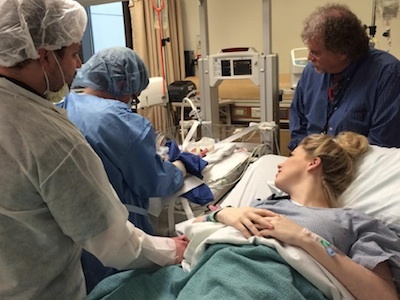 Surgical correction solved the problem but months of hospitalized bed rest followed so the pregnancy could be carefully monitored at all times. Contractions started on Christmas Eve, signaling the imminent arrival of the babies. The babies were delivered by cesarean section just before the 30th week of pregnancy; if carried to full term, the quads would have been born in March. Three of the girls weighed more than 2 pounds while one of them was slightly smaller at birth. All four babies are said to be in excellent health although they do need a respirator to help them breathe until their lungs are more fully developed. The Gardners have been chronicling the miracle of the pregnancy and birth on a Facebook page titled “A Miracle Unfolding — Gardner Quadruplets” and on the GardnerQuadSquad website as well as on YouTube. The TLC television network will feature the Gardners’ story in a special presentation set to air in late 2015. Wood, Benjamin. “Special delivery: Utah County woman gives birth to two sets of twins. The Salt Lake Tribune. The Salt Lake Tribune. 29 Dec. 2014. Web. 30 Dec. 2014. Burd, Irina. “Twin-to-twin transfusion syndrome. MedlinePlus. US National Library of Medicine. 22 Mar. 2013. Web. 30 Dec. 2014.